Come to find FSN cued us wrong, no TK in the line up. Again for the second road game straight a lot of empty seats in BankAtlantic Center. Listening to the crowd all night and it seemed we were playing at home with all the cheering in favor of the Pens. Sid the kid started things off and headed to the sin bin 3 minutes into the game, 2 minutes for goalie interference. Looks to me he's being pushed...meh. The Panthers PP wasn’t very eventful, except for a nice curl and drag from Horton but Flower read the play and made a nice save. PP killed. Geno made a great play from behind Vokoun almost sneaks one by him, but instead gets planted on his arse by Allen. Rupp didn’t like that so he drops the gloves with Allen after the following face-off. Ruppers with the win. Flower proceeded to make a great save on a Moore-slapper form the blueline. We did see a physical shift from the Jerk Store-Staal-Cooke line. Around 10:45 Sid goes on a breakaway, shoots wide on the short side of Vokoun. Afterward Sid headed to the box again for high sticking at 11:12. PP killed. PK was solid all night. Geno does some amazing moves (as usual), but it goes nowhere. Cats did a good job at keeping the pressure up. Jerk Store decided it was his turn to head to the box for tripping at 14:17. PP killed. Horton draws first blood however at 17:33, he was left WIDE open as Gonch and Free Candy were more concerned about Weiss, [0-1]. Weiss and Frolik with the assists. Pretty play, we must admit. Despite being down by a goal, the Pens played a fairly decent first period. SOG were tied 11-11. 17 seconds in Frolik goes to the box for hooking. Guerin’s stick is held which prevents him from finishing off a rebound. No call. Powerplay again comes up empty. Benny “Lava” Lovejoy coudn’t finish off a rebound of a Jerk Store shot. The puck was literally sitting on Vokoun’s door step. Great effort by Seidenberg to save the goal. Dvorak is robbed by Flower at 16:30. Fleury looking at 2-3 years with good behavior. Free Candy made a great shut down play on Nathan Horton looking for his second of the night. The Pens continued to get some momentum but sloppy passing bogging them down. Crisp passing is key. Panthers then go on a 2-on-1, the third man Ballard scores on a center drive looking play at 10:21 [0-2]. Frolik and Horton credited the assists. Free Candy made another great shutdown play, this time with the poke check on a breaking Dvorak. Sounds like a name from Star Trek, no? After, Benny Lava headed to the sin bin for hooking to prevent another breakaway. A minute later McCabe goes to the box for goalie interference. Flower then dishes out a tremendous poke check to disrupt Nathan Horton short handed breakaway. Almost three/zip. 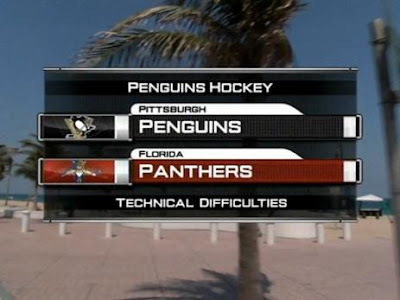 FSN decides to have technical difficulties die to a power outage in Florida. Pens end the period out shooting the Panthers 12-7, but go 0-2 on the PP. Pens came out slow to the start this period. Geno was 1-8 on the face offs and Errey did NOT approve. He pretty much called out Malkin on his poor face off skills. And rightly so. Dupes ended up taking some face offs afterward. Matthias then headed to the box for interference, but the Pens pretty much kill their own PP chance. Very depressing. I think Lemieux, Shero, Bylsma, Granato, Yeo, Crosby, Malkin, and Gonchar all need to have a little chat. Dupes must have then went to the bench and licked some Russian acid (that or 5 hour energy) because he was all over the ice. Throwing checks and getting pucks to the net. Unreal energy. Benny Lava got a great scoring chance on a nice pass from Staal but Vokoun makes the kick save. Crosby does some "making-up-for-the-first-period" heroics and prevents Horton from making it 3-1. Later we say an OUT OF THIS WORLD shift from the Rupp-Malkin-Adams line which finally paid off as Ruppers buries one into the back of the net on the doorstep of Vokoun to tie the game late, [2-2]. Geno and Addsy with the assists. Flower then makes a stick save on Frolik to end the period. Pens end regulation with 39 shots on goal. Sid almost ended the game early in OT on a 2-1 chance, Vokoun stops the shot from Sid and the rebound. Close one. Geno gets a nice crack at Vokoun, but again he makes a solid glove save. The turning point to the period was when Horton headed to the box after high sticking Staal in the face. It ends up being a 4 minute penalty. Pens go on the PP for the remainder of OT. A four on three is much more effective. As such, a solid cross-pass from Billy G allows Geno to take a shot and Mr. Crosby is waiting to the right of Vokoun for the rebound, [3-2].